SWT is a medical device used to treat and relieve the pain associated with soft tissue conditions like tendinitis/tendinosis and heelspur. 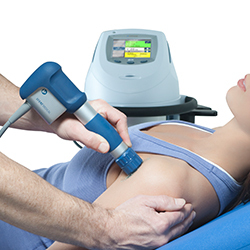 This innovative Extracorporeal Shock Wave Therapy System has provided pain relief in up to 90% of the patients treated in US and Canadian health centres and is now available in Ireland with DK Orthotics & Injury Clinic. SWT is a low energy sound wave that interacts with the tissues of the body causing a cascade of beneficial effects such as neovascularisation ingrowth, reversal of chronic inflammation, stimulation of collagen and dissolution of calcium build-up. SWT is a novel therapeutic modality without the need of surgery and surgical risks as well as surgical pain. It is convenient and cost-effective. “I work as a hairstylist so I am on my feet a lot and started to sufferingwith Achilles pain which has been going on for 20 years now. I noticed a lump, redness and swelling in the Achilles tendon developing. I continued to try run and joined the local running club whilst battling with my Achilles and getting Plantar Fasciitis on my other foot but managed them the best I could but was never able to shake it or get away from the pain. I couldn’t give the running up meant so much to me and struggled on but it came to a point where I had no choice as it was they where so bad. I went to a neuromas amount of physios to try get back but had no joy.